It is the commonest acute leukemia of adults, and its incidence increases with age. AML progresses rapidly and can cause death in few months if not treated. Pathophysiology: AML is caused by damage to the DNA of developing cells in the bone marrow. The bone marrow produces immature cells that develop into leukemic white blood cells called myeloblasts. These abnormal cells build up and over crowd the bone marrow disturbing the function of healthy cells. In most cases the cause of theses DNA mutations is unknown. Clinical Features: Signs and symptoms occur because of the absence of mature cells normally produced by the bone marrow. Patients may present with anemia, infection or bleeding. 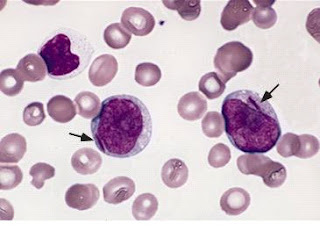 DIC occurs in acute promyelocytic leukemia, a sub type of AML, where there is release of thromboplastin. Organ infiltration leads to hepatomegaly, splenomegaly, gum hypertrophy and later CNS involvement. Infection is the main problem , related to both the disease and during treatment. Morphological Classification: There are different morphological sub types, that have largely overlapping clinical features. 1. AML with recurrent genetic abnormalities. 2. AML with myelodysplasia related changes. 4. AML not other wise specified. 5. Acute leukemia of ambigious lineage. Circulating blast cells may or may not be present. Hb is low and there is decreased platelet count. Diagnosis depend on bone marrow biopsy. DIfferentiation from ALL may be by microscopy, Aeur rods are diagnostic of AML. Metabolic abnormalities like hyponatremia, hypokalemia, elevated LDH, hyperuricemia and lactic acidosis may be seen. 1. Supportive care with reassurance and measures to help relieve fatigue. 2. Chemotherapy is very intensive, resulting in long periods of marrow suppression. The main drugs used include daunorubicin and cytarabine with appx 5 cycles given in 1 week blocks to achieve remission. 3. Bone marrow transplant from matched donors is indicated during first remission in disease. 4. Supportive care only with blood transfusion and lower dose chemotherapy may be appropriate in elderly patients .